Q: What do rainclouds wear under their Clothes? 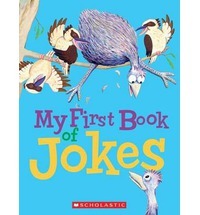 My First Book of Jokes is a colourful joke book perfect for three to six year olds. Aimed at children who are just starting to understand how jokes work, these riddles should tickle their funny bones. Q: What type of long-handled brush will always come back? The fun starts with the eye-catching cover where an emu is stuck in a tree and surrounded by kookaburras laughing so hard, they are almost splitting their sides. This humour is continued in the same way throughout the book. With full page pictures, kept simple yet expressive to illustrate the word twists, preschoolers will easily follow and understand the riddles. There is one question to a page, with the answer being revealed when it is turned. This joke book has an Australian flavour throughout, in both the illustrations and the riddles. Q: What did the platypus say after she got some new lipstick? A: Put it on my bill. These simple, logical and funny jokes will be easy for young children to remember and retell.